Cosmetic Dentistry refers to procedures done to correct imperfections in the appearance of the mouth. The color, alignment, spacing as well as regularity of the teeth are some characteristics contributing to the overall appearance. Any of these can be improved to give a stunning look to the mouth. We offer a wide variety of cosmetic options. Some of these options are whitening, smile design, recontouring the shape of the teeth, veneers, bonding, all ceramic/porcelain crowns, and Invisalign. Tooth whitening involves having impressions taken from which custom bleaching trays are made. A carbamide peroxide or hydrogen peroxide gel is placed in these trays and the trays with gel are worn for a few hours, or overnight (depending on the specific whitening agent chosen). The entire process takes 2-4 weeks of daily use. For maintenance of whitened teeth the trays should be used every several months. Tooth whitening is safe and effective, however tooth sensitivity is a common side effect. This is usually temporary and can be minimized with the use of anti-sensitivity toothpaste and fluoride rinses. The direct technique usually involves placing composite resin on the outside of the tooth. This method is usually referred to as bonding (see "bonding" under Dental Health heading). 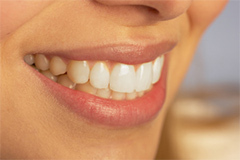 The indirect technique usually involves two appointments because the veneers will be fabricated at a dental laboratory. At the first appointment the teeth are prepared, impressions taken, and the teeth are given a temporary covering. In two to three weeks, the veneers are back from the laboratory, the temporaries are removed, and the veneers are bonded to the teeth. The laboratory fabricated veneers are usually made using porcelain or pressed ceramic, and are very esthetic.